Anyone not totally sure what a Swashbuckler is should look to the subtitle of this album "Swordsmen of the Silver Screen". The term comes from the escapist adventures of the 30s and 40s where dashing heroes beat the nasty baddies to rescue and win the heroine. It is the type of film where Errol Flynn made his name as an actor. Here the term is used to mean any film with swordplay and that wide definition allows much scope for pirate films, Robin Hood films, and an assortment of other movies featuring swords in some form. The highlights of this collection must be those magnificent themes from Erich Wolfgang Korngold including Captain Blood, The Private Lives of Elizabeth and Essex, The Sea Hawk and The Adventures of Robin Hood. From the same era we have The Adventures of Don Juan by Max Steiner, and The Mark of Zorro by Alfred Newman and Hugo Friedhofer (who started out as an orchestrator for Korngold before becoming recognised as an excellent film composer in his own right). The collection is brought up-to-date with Cutthroat Island by John Debney, Robin Hood by Geoffrey Burgon, Robin Hood: Prince of Thieves by Michael Kamen, Willow by James Horner and Hook by John Williams (well it does have sword-fighting in it). 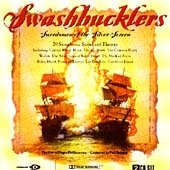 Between these two periods there is much scope for late entries to the Swashbuckler genre, Sinbad films by Rozsa and Herrmann, and much more including 4 tracks from Ridley Scott's The Duellists with interesting neo-classical music by Howard Blake more famous for his theme for the Christmas cartoon The Snowman. Although there are quiet and thoughtful moments in this collection, the essence of Swashbuckler movies tends to be action and excitement. The music fits the bill perfectly and is an excellent and varied selection from the dependable Silva Screen Records. For the most part the arrangements are faithful originals or recreations and well-played as always by City of Prague Philharmonic Orchestra under Paul Bateman. If you check out the extras on the first enhanced CD, there is a movie version of a recording session for Kamen's Robin Hood: Prince of Thieves. Also among these extra goodies are some notes on the composers for those wanting to know more. In summary this collection is highly recommended and further details on ordering can be found at at Amazon.co.uk or Amazon.com. The two versions of this album have slightly different names, but the UK version has more tracks so please check the version first.